OneCard Nigeria has really found their way in by introducing N20 and N50 Recharge Card! Senate are yet to approve the bill on payment of 9% on Data and Airtime? This is Nigeria, we have to live in it! Some weeks ago, Dangote launched a “Budgeted” Bag of Rice or Beans, not actually sure, so there is no different with the launch of the N20 and N50 Recharge Card. If all this could happen due to the Nigeria “going to recession problem” then we have to face it and fight for it. Maybe, weeks later, don’t be surprised to hear about Budgeted Clean Cloth for you and your family. In other words, if you have just N20 Naira or N50 Naira and you want to make an important call, don’t be worried, OneCard Nigeria just gave us a Budgeted Recharge card. 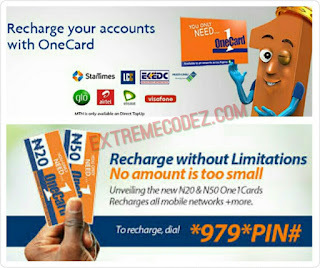 OneCard Nigeria N20 and N50 recharge cards is a multipurpose recharge card that works on any network. The OneCard Nigeria N20 and N50 recharge cards even gets better as the new recharge cards tops up all mobile networks; Airtel, Etisalat, Glo and MTN. No much worries, just dip your hands into your pocket and make that important call. You can simply recharge your lines by dialing *979*PIN#. With this, there is no need to borrow, there is no need to ask your Network or Service provider to lend your money, just use your little change and get your recharge card. But we shouldn't forget that MtnOnDemand also let's you recharge as low as N50 directly from your bank it also one of the fastest way, very easy and liable. You can also visit OneCard Nigeria to learn more about the ongoing N20 and N50 airtime recharge card. But we shouldn't forget that MtnOnDemand also let's you recharge as low as N50 directly from your bank it also on of the fastest way very easy and liable.